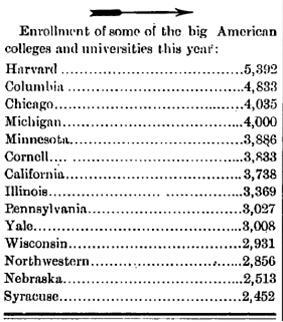 The May 18, 1905 edition of the Carlisle Indian School newspaper, The Arrow, listed the then current enrollments at over a dozen of the largest colleges and universities in the country at that time. Several of these large schools were and still are private schools whose enrollments haven’t grown anything like the state schools on the list. Perhaps the growth or lack thereof of student bodies gives us some insight as to why some of these schools are no longer football powers like they once were. It should give us a sense of what portion of the population went to college a hundred years ago – a very small portion. College students then consisted primarily of scions of wealthy families. Athletic scholarships didn’t exist then, at least officially. However, great athletes found their way into the elite schools and onto their teams, even if not always enrolled. When Carlisle started playing football against the elite schools, including The Big Four, pundits were surprised to see the Indians play so well with so little formal training. They were not thought to be smart enough to play this game that originated at the major colleges and universities. Nor were they thought smart enough to compete successfully. Carlisle’s success on the gridiron showed the larger population that they could compete on a level playing field. If Indians could master something as difficult as football, they could surely become competent in other things. Critics viewed Richard Henry Pratt, founder of the school, as an “honest lunatic” because they thought Indians were not educable. The football team’s foes soon learned otherwise and, by the very early 20th century, some Carlisle alums were attending major colleges or universities and others were coaching high school or small college football teams. Not educable? Huh! This entry was posted on April 21, 2008 at 5:41 pm and is filed under Carlisle Indian School, Football. You can follow any responses to this entry through the RSS 2.0 feed. You can leave a response, or trackback from your own site.